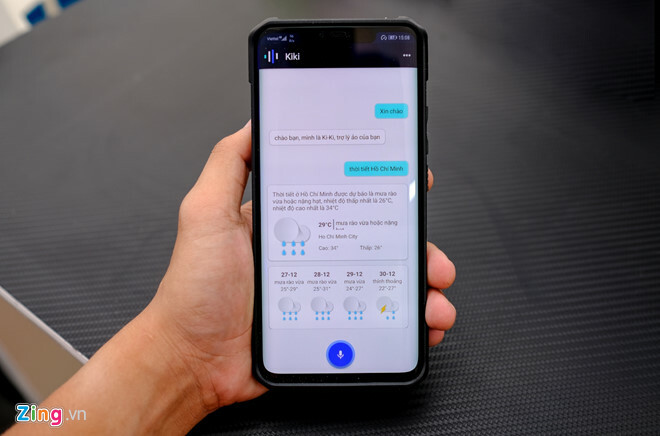 VietNamNet Bridge - Ki-Ki, the first Vietnam-made chatbot, was presented at Zalo AI Summit 2018 in late December 2018, where Vietnam’s AI community showed optimistic signs about the development of AI (artificial intelligence) in the country. Chatbots are now the focus of the ‘AI wave’. Japan, for example, has seen the launch of a series of chatbots under the form of smart speakers manufactured by technology giants such as LINE, Google and Amazon. The launch of Ki-Ki shows Vietnamese capability of catching up with the AI wave. Ki-Ki is developed by Zalo. Vuong Quang Khai from VNG, the company which develops Zalo, said it had defined the AI development path it needs to follow, on which chatbot and big data are two major parts. Ki-Ki will be a tool used for new research in the AI field with an ambition to create sophisticated AI products for Vietnamese. At present, the chatbot can carry out basic operations such as turning on music, reading news, sending messages, checking weather information and searching for knowledge. Ki-Ki can understand Vietnamese language with accents of northern, central and southern regions. It is expected that Ki-Ki will be integrated into hardware devices such as smart loudspeakers, developed into voice-based searching engine, and integrated into Zalo’s existing products such as Zing MP3, Zalo and Baomoi. However, Ki-Ki is still in an Alpha phase and it needs more effort to develop a chatbot for Vietnamese. To obtain that goal, Zalo, like any technology firm, needs to have qualified staff. This remains a big challenge. Dr Bach Hung Nguyen from Machine Intelligence Technology Lab, Alibaba, said continued learning is a must. Chinese engineers, for example, can create a new product based on technology that Google makes public two weeks before. Nguyen was a member of HoloLens project at Microsoft. Panel speakers at Zalo AI Summit 2018 said now is the right time for Vietnam to begin R&D on AI. Chinese labor costs have increased rapidly in recent years. Multi-national countries are shifting investment to neighboring countries, including Vietnam. This will lead to an increase in labor costs in Vietnam in the future. The country will not be able to catch up with the world if it begins R&D when labor costs increase. A report says AI will make up $15.7 trillion in the global economy. From 2020, the global GDP will grow more rapidly than the previous period thanks to AI. In Vietnam, AI is being used in apps such as face-identification technology cameras, smartphone chatbots, self-propelling vehicles, and nano robots.